The threats to privacy are well known: the National Security Agency tracks our phone calls, Google records where we go online and how we set our thermostats, Facebook changes our privacy settings when it wishes, Target gets hacked and loses control of our credit card information, our medical records are available for sale to strangers, our children are fingerprinted and their every test score saved for posterity, and small robots patrol our schoolyards while drones may soon fill our skies. The contributors to this anthology don’t simply describe these problems or warn about the loss of privacy—they propose solutions. They look closely at business practices, public policy, and technology design and ask, “Should this continue? 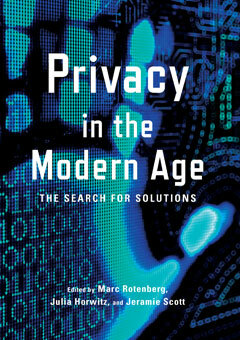 Is there a better approach?“ They take seriously the dictum of Thomas Edison: “What one creates with his hand, he should control with his head.” It’s a new approach to the privacy debate, one that assumes privacy is worth protecting, that there are solutions to be found, and that the future is not yet known. This volume will be an essential reference for policy makers and researchers, journalists and scholars, and others looking for answers to one of the biggest challenges of our modern day. The premise is clear: there’s a problem—let’s find a solution.